A few years back I survived a particularly difficult patch of life. As I was going through it, my family and friends encouraged and supported me, endlessly and patiently. I remember one encouraging gift I received from my brother and his wife–a hummingbird candle holder (I love birds of all kinds) and a card. The card was the best part, because on the inside I read these simple words: “Until life is gentle again.” That one phrase filled me with hope for a better future. I thought of that very phrase this morning when I crawled out of bed to make coffee. As my eyes adjusted to the light and I licked my dry, cracked lips, I wanted life to be gentle again. Not because I’m going through some hardship, but simply because last night I overdid it. My friend Phil and I food shopped til we dropped. Then Phil prepared the most delicious, decadent meal and served it up with style to me, the husband and friends. The spread included lamb chops seared with some spice and herb concoction pulverized in my never-used mortar and pestle, sautéed artichoke hearts with garlic and red onion, creamy sun-dried tomato risotto, and a Caprese salad to start. This was preceded by crostini with two kinds of marinated olives, Dubliner cheese, peppadew peppers (perfect combination of sweet and heat), and caper berries. As the evening waned and my friends took their families home, I realized I didn’t serve any of the ice cream Phil purchased for dessert. So I curled up on the couch and ate straight from the container. This wasn’t one of those pint-sized containers; it was an entire half-gallon and I nearly ate it all. Mind you, I haven’t eaten food this rich in a long time. Usually I eat simply, and this week I didn’t even eat much meat. I couldn’t get enough of the rare joy of those lamb chops. Needless to say, my morning was rough. Life was not gentle. I went about my day like a champ after consuming several cups of coffee, toast, followed by iced coffee, followed by water. This evening I realized I was hungry as the leftovers whispered my name. But no, leftovers, no. Life would not be gentle again, unless I treated myself gently. 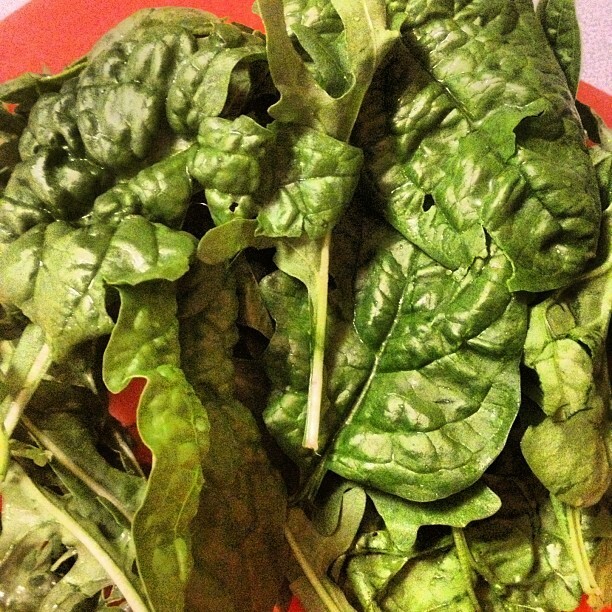 I needed something nutritious, simple, and local, so I headed out to the garden to harvest some spinach and arugula. 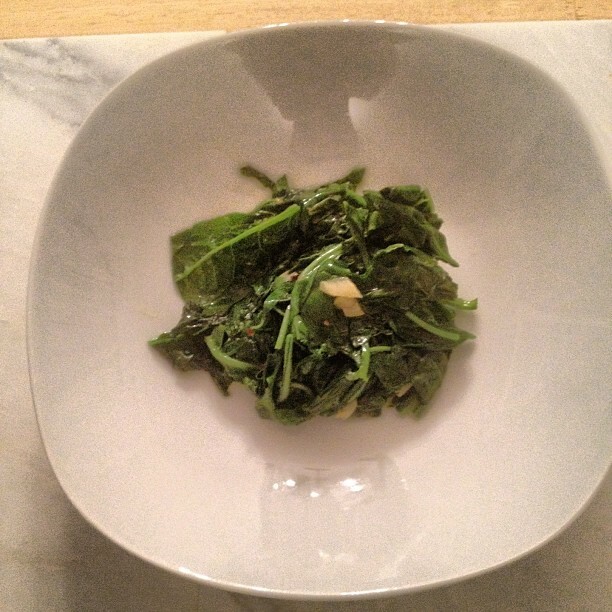 I intended to make a salad, but decided to saute it with olive oil, red pepper flakes and garlic instead. The only accompaniment was two large glasses of water. I felt revived after all those greens, but I’m not gonna lie, I hope Phil comes over again very, very soon. ← An Award! How Lovely!